It’s definitely time to trim down my subscriptions. From the second graph, you can see that I’m reliably asleep between 6a and 10a. 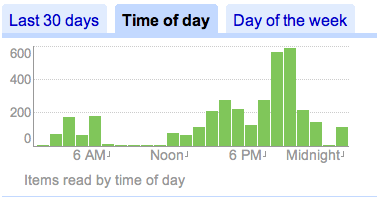 It makes you wonder how much google knows about the sleeping habits of Google Reader users. But I try not to think too hard about how much google knows. It’ll make you crazy.